Abstract: Videolaryngoscopes improve the view of the entry to the larynx in morbidly obese patients. Super obesity is one of the risk factors for difficult mask ventilation as well as difficult intubation. Super obese patients should be intubated awake either with a fiber-optic scope or with a videolaryngoscope. The glottic view during video-intubation in super obese patients using different devices was compared. The McGrath MAC (MGM) was used in all patients and then compared to the King Vision (KV) in three patients, the APA videolaryngoscope in two patients and the Airtraq Avant with a video camera in four patients. The pictures were of the same patient for two used devices. All obtained images were analyzed using the Percentage of Glottic Opening (POGO) scale. The POGO score for the MGM was better than for the KV and the APA but comparable to the Airtraq device. The images were processed electronically, and the best view of the laryngeal inlet that was obtained by the evaluated devices in the same patient was superimposed onto the other one and then compared. The glottic view during video-intubation in super obese patients was compared. This study was approved by the ethics committee of the Medical University of Łódź (RNN/331/15/KE). Nine super obese patients were included into the study. Written informed consent was obtained from all patients before surgery. All participants provided written informed consent to publish this paper and accompanying images. Demographic data are presented in Table 1. The patients were scheduled for elective bariatric surgery in a teaching hospital. Anesthetic management was based on the guidelines of European Society for Perioperative Care of the Obese Patient (www.espcop.org). Following effective pre-oxygenation, general anesthesia was induced with intravenous propofol (dose adjusted for bispectral index monitoring [BIS 40-60]). After confirming that bag mask ventilation was possible, intravenous rocuronium was administrated at a dose of 1.2 mg·kg−1 of the ideal body weight. Once an adequate muscle paralysis was confirmed with train-of-four monitoring, the intubation attempts were commenced with the studied devices. All of the evaluated videolaryngoscopes were used in a random order. The McGrath MAC (MGM; Aircraft Medical, Edinburgh, United Kingdom) with blade size 3 was used in all studied cases. The King Vision (KV; Ambu, Ballerup, Denmark) with a non-channeled blade was used in three individuals (patient number 1, 2 and 3). The APA videolaryngoscope (Venner Medical, Singapore, Singapore) with an MAC blade size 3 was used in two cases (patient number 4 and 5) and the Airtraq Avant with a video camera (Prodol Meditec, Las Arena, Spain) was used in four patients, ie, patient number 6–9. The pictures were of the same patient for two used devices. A picture from the monitor display was taken when the best view of the glottis was achieved. This was always done with the same camera and the same investigator for both devices. An additional dose of propofol was administered during an intubation attempt with the second device in order to prevent accidental awareness. Bag mask ventilation was also performed to maintain oxygenation between intubation attempts. General anesthesia was continued once all relevant data were collected. Abbreviations: BMI, body mass index; M, male; F, female. Figure 1 Images electronically processed from patient number 3. Notes: Image obtained using the KV (A), and obtained using the MGM (B). Superimposed images (C). The yellow line indicates the position of the epiglottis in (B) compared with the position of the epiglottis in (A). Abbreviations: MGM, McGrath MAC; KV, King Vision. The demographic data are presented in Table 1. The mean values were as follows: weight 146.33±19.87 kg, height 1.68±0.128 m, BMI 51.84±2.77 kg·m−2, age 41±12.13 years and neck circumference 47.66±3.9 cm. Five men and four women participated in the study. The results of the image evaluation are presented in Table 2. The examples of pictures taken during the study are shown in Figures 2A and B (comparison of the MGM and the KV), 3A and B (comparison of the MGM and the APA) and 4A and B (comparison of the MGM and the Airtraq). The POGO score for the MGM was better than for the KV and the APA but comparable to the Airtraq device. However, the C-L grade one view was achieved in all cases when the MGM was used. In one case during the use of the KV device, the C-L grade was 3, and there was grade 2 view (C-L) for the APA in one patient. For the Airtraq device, the C-L grade was 1 in all cases. Intubation was possible and uneventful during all attempts. There were no complications related to the glottic visualization. Note: “–” indicates not applicable. Abbreviations: POGO, Percentage of Glottic Opening; C-L, Cormack–Lehane; KV, King Vision; MGM, McGrath MAC. Figure 2 Images obtained from the same patient with two devices. Notes: (A) Patient number 1, device used: MGM. (B) Patient number 1, device used: KV. Figure 3 Images obtained from the same patient with two devices. Notes: (A) Patient number 4, device used: MGM. (B) Patient number 4, device used: APA. Figure 4 Images obtained from the same patient with two devices. Notes: (A) Patient number 7, device used: MGM. (B) Patient number 7, device used: Airtraq. The probability of difficult intubation is increased with higher BMI values.14 Neck circumference of >42 cm and BMI of >50 kg·m−2 (super obesity) are two independent predictors of difficult intubation.15 Dixit et al16 observed that 44.4% of super obese patients had C-L grade 3 and 4 views compared to 20.4% of the morbidly obese patients. These results confirm that it is necessary to be prepared for difficult intubation in super obese patients. Therefore, the use of videolaryngoscopes is justified in this group of patients. In all the available articles, during video-intubation of morbidly obese patients, C-L grade 1 view was achieved in all patients.1–3 There is also a study available on the evaluation of the laryngeal inlet visualization in super obese patients using the TotalTrack Video Laryngeal Mask device. C-L grade 1 view was also achieved in that study.17 There was no evaluation of more sensitive scale than the POGO.13 The POGO score was chosen for this study instead of C-L classification because the former is more adequate. There are several problems regarding the C-L classification and grade 1 and 2 views in particular. The distinction between C-L grade 1 and 2 views is important because they were achieved in 99.7% of patients.13 In addition to this, the variability within the grades is also significant. 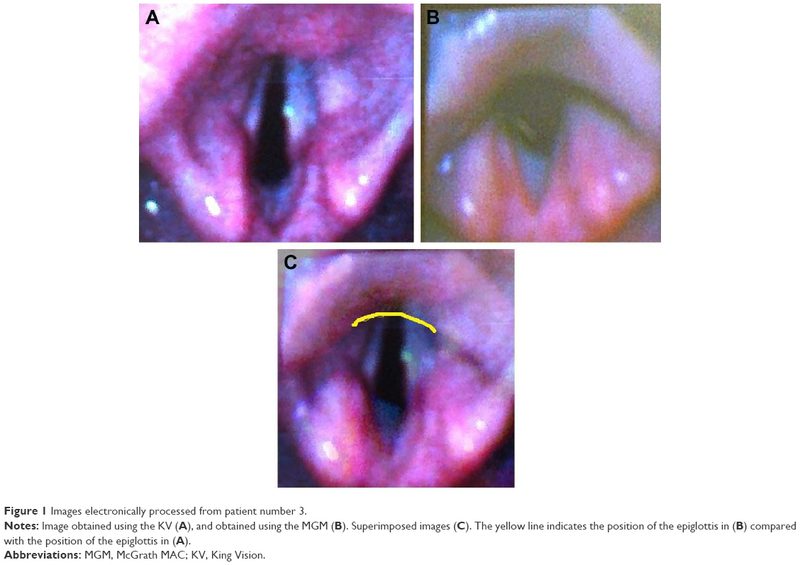 Benumof noted that the percentage of the vocal cords visible in grade 1 view could vary from 1 to 100%.18 The POGO score appears to be more appropriate when videolaryngoscopes are used. In this study, only the performance of Airtraq Avant was similar to that of the MGM. It has already been described that the use of the Airtraq device provided very good conditions for intubation in the morbidly obese patients. However, no study has been performed in super obese patient population.19–21 Cierniak et al in their study assessed technical properties of video intubating devices, which showed that there could be significant differences between them regarding the clarity, focus and image quality.8 As this was a manikin study, it is difficult to extrapolate the results of such studies into real patients. To the author’s knowledge, this is the first study to evaluate video intubating devices in patients with an increased risk of difficult intubation, ie, super obese patients. This study demonstrates that despite the use of videolaryngoscopes, the glottic visualization may not be perfect. Moreover, this study shows that videolaryngoscopes are good intubating devices in super obese patients. However, even in the same patient, the achieved glottic view may differ between devices. Difficult intubation is very common in super obese patients. Videolaryngoscopes may improve the view of the glottis in these patients. Certain devices may be preferred over others in such a setting. The weakness of the study is the small sample size. However, this work adds important information to the current literature on the new devices for intubation of super obese patients. The future work should focus on the evaluation of different video intubating devices. Such devices should be compared to one another and not to the classic Macintosh blade laryngoscope. The rationale for this is that video intubating devices always outperform the Macintosh blade laryngoscope in visualization of the glottis in patients known to be difficult to intubate. It is important to assess which video device offers both a better performance as well as increased safety. The POGO score was better for the MGM than for the KV and the APA but comparable to the Airtraq device. All devices under study allowed safe and effective intubation in super obese patients. Marrel J, Blanc C, Frascarolo P, Magnusson L. Videolaryngoscopy improves intubation condition in morbidly obese patients. Eur J Anaesthesiol. 2007;24(12):1045–1049. Dhonneur G, Abdi W, Ndoko SK, et al. Video-assisted versus conventional tracheal intubation in morbidly obese patients. Obes Surg. 2009;19(8):1096–1101. Yousef GT, Abdalgalil DA, Ibrahim TH. Orotracheal intubation of morbidly obese patients, comparison of GlideScope® video laryngoscope and the LMA CTrach™ with direct laryngoscopy. Anesth Essays Res. 2012;6(2):174–179. Gaszyński T. Clinical experience with the C-Mac videolaryngoscope in morbidly obese patients. Anaesthesiol Intensive Ther. 2014;46(1):14–16. Maassen R, Lee R, van Zundert A, Cooper R. The videolaryngoscope is less traumatic than the classic laryngoscope for a difficult airway in an obese patient. J Anesth. 2009;23(3):445–448. Andersen LH, Rovsing L, Olsen KS. GlideScope videolaryngoscope vs Macintosh direct laryngoscope for intubation of morbidly obese patients: a randomized trial. Acta Anaesthesiol Scand. 2011;55(9):1090–1097. Maassen R, Lee R, Hermans B, Marcus M, van Zundert A. A comparison of three videolaryngoscopes: the Macintosh laryngoscope blade reduces, but does not replace, routine stylet use for intubation in morbidly obese patients. Anesth Analg. 2009;109(5):1560–1565. Cierniak M, Timler D, Wieczorek A, Sekalski P, Borkowska N, Gaszyński T. The comparison of the technical parameters in endotracheal intubation devices: the Cmac, the Vividtrac, the McGrath Mac and the Kingvision. J Clin Monit Comput. 2016;30(4):379–387. Norris A, Heidegger T. Limitations of videolaryngoscopy. Br J Anaesth. 2016;117(2):148–150. Leykin Y, Pellis T, Del Mestro E, Marzano B, Fanti G, Brodsky JB. Anesthetic management of morbidly obese and super-morbidly obese patients undergoing bariatric operations: hospital course and outcomes. Obes Surg. 2006;16(12):1563–1569. Gaszyński T, Gaszyńska E, Szewczyk T. Dexmedetomidine for awake intubation and an opioid-free general anesthesia in a superobese patient with suspected difficult intubation. Drug Des Devel Ther. 2014;8:909–912. Pelosi P, Gregoretti C. Perioperative management of obese patients. Best Pract Res Clin Anaesthesiol. 2010;24(2):211–225. Levitan R, Ochroch A, Kush S, Shofer F, Hollander J. Assessment of Airway Visualization: validation of the percentage of glottic opening (POGO) Scale. Acad Emerg Med. 1998;5(9):919–923. Lundstrøm LH, Møller AM, Rosenstock C, Astrup G, Wetterslev J. High body mass index is a weak predictor for difficult and failed tracheal intubation: a cohort study of 91,332 consecutive patients scheduled for direct laryngoscopy registered in the Danish Anesthesia Database. Anesthesiology. 2009;110(2):266–274. Riad W, Vaez MN, Raveendran R, et al. Neck circumference as a predictor of difficult intubation and difficult mask ventilation in morbidly obese patients: a prospective observational study. Eur J Anaesthesiol. 2016;33(4):244–249. Dixit A, Kulshrestha M, Mathews JJ, Bhandari M. Are the obese difficult to intubate? Br J Anaesth. 2014;112(4):770–771. Gaszyński T. TotalTrack video intubating laryngeal mask in super-obese patients – series of casus. Ther Clin Risk Manag. 2016;12:335–338. Benumof JL. Conventional orotracheal and nasotracheal intubation. In: Benumof JL, editor. Airway Management: Principles and Practice. St. Louis: Mosby-Year Book; 1996:261–276. Dhonneur G, Ndoko S, Amathieu R, Housseini LE, Poncelet C, Tual L. Tracheal intubation using the Airtraq in morbid obese patients undergoing emergency cesarean delivery. Anesthesiology. 2007;106(3):629–630. Ndoko SK, Amathieu R, Tual L, et al. Tracheal intubation of morbidly obese patients: a randomized trial comparing performance of Macintosh and Airtraq laryngoscopes. Br J Anaesth. 2008;100(2):263–268. Gaszyński T, Gaszyński W. A comparison of AirTraq optical laryngoscope and classic Macintosh blade laryngoscope for endotracheal intubation in morbidly obese patients. [Porównanie zastosowania laryngoskopu optycznego AirTraq i laryngoskopu klasycznego z łopatką Macintosh do intubacji dotchawiczej u chorych z otyłością]. Anaesthesiol Intensive Ther. 2009;41(3):145–148. Bertran S, Chouillard E, Kassir R. Difficult tracheal intubation in obese gastric bypass patients. Obes Surg. 2016;26(10):2490–2491.